Military officers in Isan, Thailand’s Northeast, intimidated academics and students on environmental research in areas with potash mining planned. 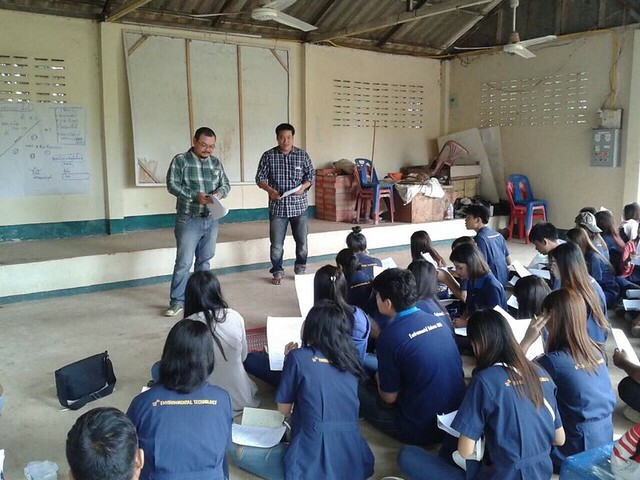 Three military officers from 24th Army Region base in Udon Thani Province on Wednesday morning, 16 September 2015, came to Huai Sampad Sub-district, Prajaksilapakom District, of the province to monitor activities of academics and students while they were in the field research on local environment and public health. The research project is co-organised by the Science Faculty of Rajabhat University of Udon Thani and Chulalongkorn Social Research Institute. It is also supported by the Thai Health Promotion Foundation. The project began since 2014. In the field research, 40 students from Rajabhat University asked the residents of several villages in Prajaksilapakom District questions about health, local environment, and economic opportunities in the region. According to Santiphab Siriwattanapaiboon, an environment lecturer of Rajabhat University, participants of the research project felt uncomfortable and intimidated by the officers. The military officers reportedly recorded the name list of the project participants and took pictures. Moreover, they asked to see the questions, which the students asked the villagers with. Santiphab added that the officers told him that if he refuse to give information about the project in detail, they would have to refer to his superiors. The lecturer said the in order to understand the the socio-economic and environmental problems in the area where the locals have been fighting against the proposal to construct potash mines in for the last 15 years, such research project is crucial. He mentioned that the measures from the military officers is a threat to academic freedom.